This game was created in 1970 by John Conway, a mathematician from Cambridge who performed research on so-called “cellular automations.” Conway’s Game of Life attempts to model a society of living organisms capable of living and replicating in response to their neighbors. Any dead cell with exactly three live neighbors becomes a live cell, representing reproduction. You can even build a computer in the Game of Life capable of performing logical and numerical computations. 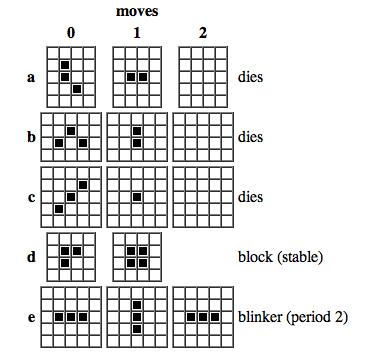 In fact, The Game of Life is theoretically as powerful as any other physical or theoretical computer (it is proven to be a universal Turing machine). We can see all the main features of real biological life appearing here: replication with mutations, chaoticity and unpredictability. Small changes in the initial pattern can completely change the whole process, and it is impossible to predict whether a given pattern will occur from a given initial state. Self-organization is also present, as structures with apparent purpose (to move or to spawn ‘children’) emerge from seemingly random initial states. We can extend the model, for example by placing obstacles on the field or by introducing ‘predators’ that boids try to avoid. But even in the simplest models we, again, notice the emergence of complex behaviors, such as flocks splitting and reuniting after avoiding predators and obstacles or spontaneous changes in direction. The Boids model is so realistic and beautiful, it has even been used in computer games (Half-Life) and animation! One of my favorite online implementations is shown below, but you can also fiddle with the parameters in the version by Harmen de Weerd, which include number of agents, movement speed, predators, alignment with flockmates, predator avoidance, and proximity to center. Although The Game of Life and Boids are different in almost everything, the core idea is the same: when making a model, we don’t need a complex set of rules for complex patterns and behaviors to emerge. This idea can be readily applied to biological life. The process of evolution is complicated, almost chaotic and random at times, but that does not mean that the rules of evolution are also complex. There are only a few conditions that a group of organisms (or, more generally, ‘replicators’) needs to satisfy to evolve. First, the organisms have to reproduce with changes, which means they need to have variability in some of the traits. Second, natural selection should act on this group by means of selective pressure. That is, the organisms should replicate with different rates depending on the traits they have. This could be competition for resources, or differential survival because of the environmental stress, or something else. So it seems like our whole biosphere emerged by obeying just these two fairly simple rules. There are also interactive biogames where players take an active part in the process and can compete with other players, and they serve a different purpose, aiding scientists who may lack computational and human resources. We will explore two such games. FoldIt is all about protein structures. It is a puzzle game where you have to move, twist, rotate and tweak proteins to find the most stable form. After a introductory tutorial, you are given a model of a some protein, typically one that interests researchers. We know the amino acid sequence, but the 3D crystal structure – the arrangements of all of the atoms in space – is unknown. The challenge is to search for a structure with the least energy, with all hydrogen bonds and hydrophobic interactions in place. The lower the energy of the protein, the higher the score you get. After the challenge finishes, scientists take the structure with the highest score and try to verify if it exists in the real world. The next game, EteRNA, developed in part at the Das Lab at Stanford, tries to achieve similar goals but for a much more interesting class of molecules: RNAs. RNAs play an equally important role in the cell, but we know much less about RNA folding and structure than about proteins. Similar in chemical structure to DNA, RNA has many more functions and forms, with its loops, hairpins, and knots. 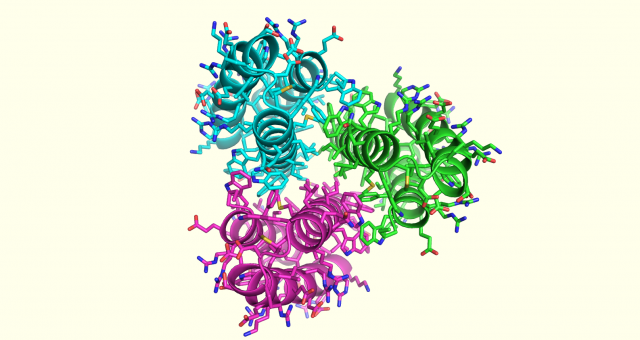 RNAs can even serve as enzymes. Understanding more about RNA folding and structures to later unravel RNA function is of great interest to researchers. EteRNA tries to make progress in this area by developing the method of obtaining RNAs that fold into any desired shape. The gameplay is almost opposite of FoldIt. You are given a desired shape (a secondary structure), and you need to find the sequence of nucleotides that makes this shape the most likely based on favorable chemical interactions. After you get comfortable with the mechanics of the game, you get access to the CloudLab, where you can participate in research. Here, the structures you suggest may be then synthesized and tested in the Das Lab. The recent projects include the development of a tuberculosis diagnosis device which recognizes the RNAs of the tuberculosis pathogen and the invention of special guide RNAs for CRISPR that can turn off the process of gene editing when a small molecule is introduced. There are of course many more games, puzzles and models out there, but they are all united by the idea that there is a place for beauty and entertainment in science.